We are five 10 year-old boys. We have known each other since preschool. Our parents call us “the Crew.” Boys and Ballet is our blog. You can read more about us here. One of our favorite channels on YouTube is ilyaballet. Ilya is better known as Ilya Kuznetsov. He attended the Bolshoi Ballet Academy from 1984-1992. After graduating, he was a soloist for the Bolshoi Theatre (’92-’94) and the Moscow Classical Ballet (’94-’95). In 1996 he was a finalist in the Nuriev Ballet Competition and the International Ballet Competition. Mr. Kuznetsov was a principal soloist for the Imperial Russian Ballet (’95-’98) and the San Diego Ballet (’98-’02). He has been a classical ballet teacher at the Bolshoi Ballet Academy since 2002. Mr. Kuznetsov has uploaded videos of student from Vaganova and a large number of shorts of current and former Russian dancers and teachers. The Vaganova Ballet Academy videos are well worth watching. The boys demonstrate each level of the Vaganova syllabus through grade five (Grade 4 is currently unavailable. Perhaps Mr. Kuznetsov will upload it later). We are five 10 year-old boys. We have known each other since preschool. Our parents call us “the Crew.” Boys and Ballet is our blog. Our parents have decided to open the blog to boys who want to write about their adventures in dance. They asked us to be the first guest contributors. Our ballet master is Hungarian. He danced in Europe, the United States and Great Britain before settling in the U.S. We are glad he came to our town. Our Hungarian has a accent. It can take a few weeks to understand him. We have a lot of fun with it. He absolutely tortures French. 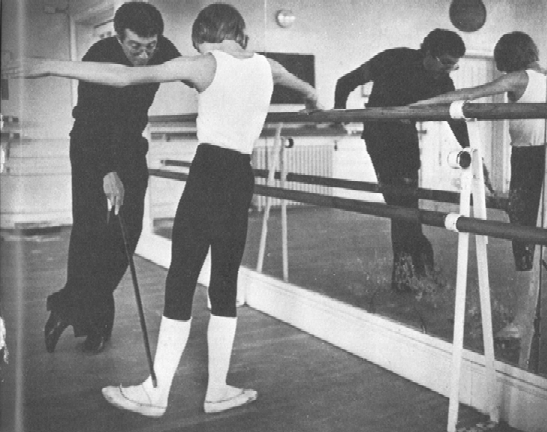 Like many Europeans, he was taught the Vaganova method as a boy and that is the method he teaches us. He is very demanding. He does not allow sloppiness. He insists on proper form, line and movement. We try not to laugh when our Hungarian says “sloppy,” but we are only 10 years-old and it is so funny. When we first started ballet, he taught us our manners. We had learned them at home but he wanted to be sure we would use them in class. And, of course, he taught us reverence. There are eighteen boys in our class. The boys are 10 to 16 years-old and have been dancing for two to eight years. This does not phase the Hungarian at all. He will send half of us into the “torture chamber” (he calls it a weight room) while teaching the other half. Then the groups will switch. Ours is the only boys’ class in our area. None of the other ballet schools have boys over 9 years-old including the ballet company school. The older boys are all at our school because we have a Hungarian ballet master. The eldest dancing boy (DB) says its because our Hungarian is the only fulltime male instructor in the city, but he’s a teenager and can’t be trusted. Our lessons are probably not much different than yours. We stretch before class. The class starts with pushups, sit-ups and four-points. What? You haven’t heard of four-points. It is a most “cruel and unusual” form of torture. Start by laying down on your stomach then raise up on your elbows and toes. Hold that position for four minutes if you can. Once we have recovered, there is work at the bar, a break, then floor work. The routine rarely changes. Our class is 1 ½ hours. We have two classes one week then three classes the next week and twice a month character dancing on Saturdays. Our dance schedule allows us to pursue our other interests such as choir, gymnastics, swimming, music and playing with our friends. Character dancing is a lot of fun. It is a combination of dancing, acting and mime. It is in character class that we tease our Hungarian. We would never do it in ballet class. It was in character class that the Hungarian made the mistake of calling us precocious. We have never let him forget it. Our Hungarian says that music is the soul of dance and that a dancer that does not know music will never achieve his full potential. In ballet the music is mostly classical and that is what we are studying. It is the music that makes us want to dance. It is from the boys’ choir that we have learned the most about music. Before a boy can become a chorister, he has to be able to sight read, pass a written test on music theory, and an oral test where he is asked questions about the music he is hearing. If a DB is serious about music, he should join a choir. Our choir has a band. We play the cello, clarinet, violin, and piano. The eldest DB plays the organ. He’s good at it too. We have only been taking lessons for three years so we still have a lot to learn. Our ballet school wants us to train in other sports. A dancer, despite being physically fit, is not necessarily an all-around athlete. According to our Hungarian, dancers have a lot of explosive power (needed for leaps, jumps and lifts) but not a lot of stamina. By training in other sports a dancer can work his muscles in different ways thus building strength and stamina. Stronger bodies are less likely to get injured. We are gymnasts and swimmers. Ironically, it was our gymnastics couch that sent us to ballet class. We wish to thank the Hungarian for teaching us and the eldest DB for answering our questions and proof reading. Unfortunately, there were still some mistakes in the final draft, so our tutor gave us a B+. We didn’t know we were being graded!! !